This is the third post in a series that traces the history of the popular neighborhoods of casas baratas (cheap houses) in Barcelona, a reservoir of immigrant factory workers in the middle of nowhere, historically anarchists and involved in the Civil War against Francisco Franco. Above: José Capdevila being harassed by the police after being evicted from his Casa Barata, October 19th, 2007. Photo by Jordi Secall. On October 19th, 2007, Barcelona’s riot police broke in to five houses in Bon Pastor. They weren’t arresting a drug dealer, nor acting against gender violence; like in all the ghettos, although the police is perfectly aware of violence and crime, they seldom enter. But in this case, the police acted without hesitation. 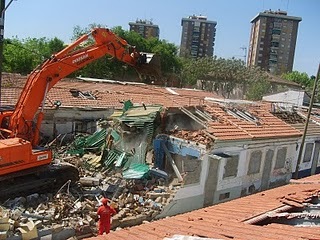 Right: Demolition of the first 145 Casas Baratas, in 2007. Photo by Edgar Fenoy. These five families did not accept the Urban Renewal Plan that the Barcelona City Council prepared for Bon Pastor’s neighborhood, so they had their doors broken down and they were forced to leave from the houses in which they were born. Paca, the eldest, is 76 years old; Josefina is 65 and had her son and daughter lived with her; Ramón is 50 years old and a former member of the Asociación de Vecinos (Neighbors Association), and has two sons, Edgar (12) and Iván (30); Aurora and José, in their 50s, are relatives of Bon Pastor’s most famous musicians, Rumba Tres. They all still hold the rental contracts they inherited from their parents, and have continuously paid 20 to 40 euros every month for their houses. How did the City Council manage to put forward this Urban Renewal Plan that involved the demolition of the casas baratas? The Asociación de Vecinos protested against the proposal to demolish the neighborhood at the end of Francisco Franco‘s dictatorship. But that same asociación, at the end of the regime, suffered an important political change: from being an antifascist and politically active neighborhood organization, into something close to a local section of the political party ruling the city administration. So this Urban Renewal Plan, purported as “social” and “participatory” by a left-wing government, could count on the local support of this historical neighborhood association. Still many neighbors disagreed strongly with the Renewal Plan: a group of elder residents, in 2003, founded an association against the Plan, and gave it the evocative name of Avis del Barri (Grandparents of the Neighborhood). But both the press outside Bon Pastor (controlled directly and indirectly by the City Council) and the propaganda inside the neighborhood (organized by the Asociación de Vecinos, often through rumors or menaces) made the struggle of the Avis del Barri extremely difficult. 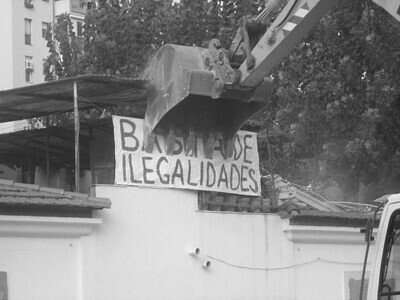 Eviction in the Casas Baratas, October 19th 2007. On the day of the eviction, many residents of the casas baratas and other nearby neighborhoods approached to protest, because they knew that the five families were still paying their rent and maintaining their contracts. The riot police charged brutally against them, leaving some 10 people injured, including some of the recently-evicted neighbors. Some received direct threats insults, but the main result of the operation was scaring the whole neighborhood to death, so that nobody would think again of opposing against the Urban Renewal Plan. Meanwhile, the Plan itself was receiving international awards as a participatory and people-oriented urban solution, confirming the image that the Barcelona City Council was building for itself, as a model for social and left-wing urban policies. Read the next post or previous post in this series. The Cabanyal has been one of the referents for Bon Pastor’ neighbors in their struggle against the urban renewal plan. But while in Valencia the residents collected some victories, the same thing didn’t happen in Bon Pastor. Check our blog on urban anthropology, maybe it could interest you. If some day you like to write something on Valencia, just tell me. For me, it’s fascinating to see all these perspectives on a city I’ve never been to.